Clothes. We all wear them (well, hopefully!). They can be a symbol of power and success …or poverty. They can be a source of ridicule at school or at work...or they can land you in the “cool” crowd. Do you ever notice how clothes tend be a major conversation starter? It's always interesting to talk with people about their clothes. You can learn a lot about people by how they view their clothing...where they shop, etc. Clothes are a powerful tool…but they can control us if we let them. When you are trying to simplify your life and downsize your possessions, you can’t ignore this area. It tends to be avoided because clothing is so personal...there are often a lot of emotional attachments connected to it. As I looked through my closet about 6 months ago, I started to ask myself some questions? Why do I have 4 plain white t-shirts? When was the last time I wore those shoes? Last year? Why do I “need” 6 pairs of jeans? How many pairs of socks do I really need?! I had to look inward and try to discover why I felt like I needed all of these clothes…when there are others who have so little. I also started to wonder when our culture became clothes obsessed. 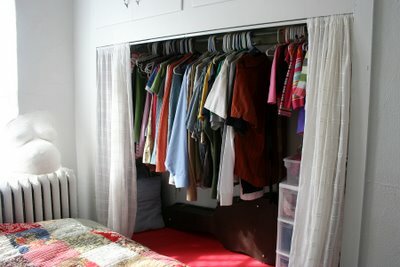 According to the hgtv.com website, clothes used to be stored in chests or armoires up until after WWII...and then there was a bigger need for housing and they started to build closets as they build the new homes. This is also around the time that TV was being introduced to the masses. I can't help but think that all advertising created the false sense of need for more clothing. Even today...if I watch too much TV/advertising, I immediately start feeling discontent with my current possessions and feel like I need to buy more to be happy. After we stopped watching so much TV, I no longer had a "voice" coming into my home telling me what to wear, what to think, and what to buy. Stewardship: What would Jesus say if he opened your closet door? I have to admit that I hadn’t ever really thought about what Jesus says regarding clothes up until about 6 months ago. Growing up, I had the typical attitude that you just couldn’t have enough clothes. And don’t even think about wearing USED clothes! *GASP!*. It takes time to change how you’ve always thought. When I started studying on that topic…I realized that Jesus really doesn’t care about clothes much at all…and he tells us that we shouldn’t focus on it so much. It’s clear that Jesus thinks we have better things to put our time, energy, and money into than clothes. If you are going to focus your energy on it...it should revolve around getting clothes to people who truly need them. "I found out that the less you shop, the desire to shop would decrease. And eventually, when you are walking in a mall, you have this weird feeling while watching people buying stuff...thinking, why would people need THAT...and you suddenly feel like an alien." I can definitely relate to that feeling...especially now that I'm not shopping at malls. It's a very weird phenomenon. Does it fit me correctly? Or have I just been telling myself that? If you can’t answer yes to all of the above, throw it in the “Give” pile. If you having some emotional issues letting it go, throw it in the “Not Sure” pile. The key to going through your clothes is to do it FAST…the more you sit and think about each item…the more you will THINK you want/need to keep it. Clothing is easy to come by…if you give away something you need later, find another one. Also, it does help to have a friend or spouse do this with you…so that when you need a second opinion, there is one readily available. However, don’t ask your packrat friend to help you…she will only hinder. A side note…I know there are some of you thinking, “What about my Aunt Berta’s pink leather jacket”! If you have heirloom items in your closet that you no longer want…you should ask around the family and try to pass them on that way. If not, take a photo of the item, put it in an album and write out all of your memories about it…and then get rid of it. Where do I take it? Can I sell it? If you want to sell some of your clothes…try a consignment store. You can take your clothes into the store and as they sell, you will get a percentage of the profit. I prefer to just get rid of it all and be done with it…so I usually opt for Freecycle or Goodwill. Fill a bag, take it in, DONE. You could also take them directly to a women's shelter...they are always happy to receive nice women's and children's clothing. I have sold some nicer items online if I know there is a market for them and I needed some quick cash. You could also try a a clothes swap...or as I've heard them called, a "Naked Party" and invite a bunch of your girlfriends over to swap clothes. Here are the details on how to do it. Disposable Clothing We live in a "disposable" obsessed culture. I have switched my house to completely re-usable/cloth everything... so why do I buy disposable clothing? The items that I've bought in the past from Old Navy, Target and other discount stores are usually a one- season item and then they are trashed. If I would have just bought higher quality to begin with, many resources (and headaches) would be saved. Now that we are Compacting, I'm not going into those stores at all anymore and my closet is so much better off! I think that is one of the great things about thrifting...almost everything I've found has been a high-quality brand that will last and last...but without the high price. I've also found that when you have less clothing, you tend to take better care of what you have. With my "disposable" clothing, I didn't care if something stained it or if it ripped. What does YOUR closet look like Sara? In the photo above, you can see what my closet looks like. The far left section is mine. Over the last 6 months I have gotten rid of about 75% of my clothes…and I don’t miss them! It’s so much easier to do laundry, to clean up, to sort…when you don’t have a mess of clothes in your closet. It’s immeasurably easier to get dressed in the morning when you only have a few choices. Since moving into the apartment, I’ve gotten a few more items simply because we don’t do laundry as much now. But I LOVE the simplicity of having less clothes. Less stress. Less mess. Less is good…now go clean your closet! I've been thinking about trash. Moving to a small apartment with a small garbage can has made me very aware of what I throw away. Having to walk the garbage bag down 3 flights of stairs, then down another to the basement, out the back door...and a short walk to the ally makes me not want to make much trash! We usually fill up one small garbage bag a week...but even that seems like so much! I'm still trying to figure out where I could take my food scraps to reduce that even further. One of my goals during The Compact is to buy groceries/food with little to no packaging. This drastically reduces the amount of trash one produces. I'm amazed by how much trash we can throw away just by ordering take-out one night! Wow. A movie that is closely related to this topic is "The Gleaners and I" (thanks Ali!). I just finished watching this quirky little French film about modern day gleaners and urban scavengers. It was incredibly interesting to me...I've always been curious about the lives of experienced dumpster divers and people who live completely off of the trash that others create. The movie goes far beyond that and delves into the world of found object art and into the lives of those making a difference in their neighborhoods. I can't say enough about this movie...I think everyone should see it. Today, when you throw something away...ask yourself if it could be recycled, re-used, or given to someone who needs it (Freecycle!). In a disposable culture...it may feel weird at first, but it does the earth GOOD!